Or. Those of us who felt called should have gone to Raleigh, and, if asked, answered that our religious commitment inspired us to be there -- and why. Or, we might have answered why we were there and it wasn't religious. Both Unitarianism and Universalism stood up for the individual conscience. We do a poor job of remembering that now. 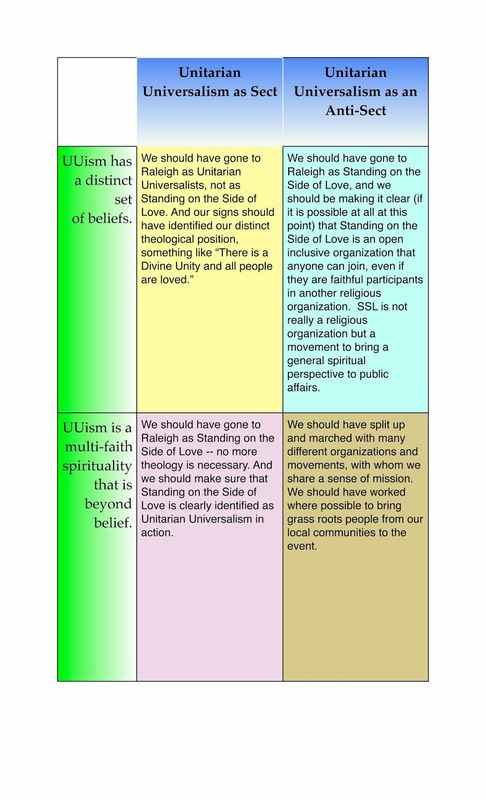 As a "UU as Sect" person, what I found most interesting about the Raleigh experience was seeing how Rev. Barber has created a strong interfaith coalition by being unapologetically rooted in his own faith. I passionately support Standing on the Side of Love's model, and yet I also appreciate Barber's willingness to speak out of his own tradition and trust others to translate. I would like to see you add the category of denomination (and anti-denomination?) to your chart, Tom. I think UUism no longer fits the sociological definition of sect and anti-sect, or at least not perfectly. You could prove me wrong, of course, but what distinguishes a sect is that it is a grassroots church "movement"--small, and with no large infrastructure or accountability structure, or standards and norms. Sects are nimble and creative because there is no one "in charge" and no orthodoxy, no book of discipline. Usually, sects become unsustainable if they grow (or if they shrink) which is why they become denominations. They become institutionalized out of necessity. 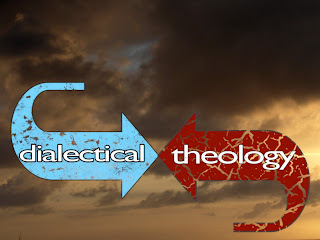 Sects start as a theological difference (usually a heresy, or a "reform"). Pentecostalism, in all its many forms, is still in sect form, and still growing like gangbusters. UUism's time as a sect ended, I would argue, when the AUA began. Or the MFC, maybe. Maybe you have an argument against this distinction based on our congregational polity. I think there is one to be made. And if so, I'd like to hear it, because I think whether we are a sect or a denomination matters to this conversation. 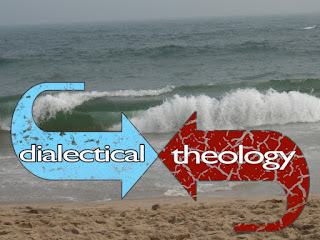 Do we function like a sect (a grassroots movement), or a denomination, or some mix of the two? Great Question Robin! How do you see this difference playing out right now for us? Does the fact that we are no longer a sect but a denomination just mean that we are clunkier. Are sects less obsessed with their own distinct identity, or more invested in their particular distinctive beliefs? Is the difference just in the organizational realm or is it at the level of identity? Also, we are a small denomination, and therefore much more nimble than, say, the UMC (which also began as a very nimble and spirit-filled sect). However, we are definitely clunkier because we are a denomination than we would be if we had remained a sect. We are also still here strictly because we became a denomination, no matter how clunky. We need institutions because they last. I think the fact that we do not function like a sect at all speaks to our "stuckness" that you highlight in another post. Most important, I think, is your question about sects being more or less obsessed with their own distinct identity and beliefs. Sects start out precisely *because* they are obsessed with their own distinct identity...usually the identity entails a sect's distinct way of reforming the Church, and getting "back to the basics" somehow. Unitarianism and Universalism started as distinct theological heresies. So we became sects initially because we were fervent about our unique, distinct identities. Sects are also noted for not being "fixed" and "stuck" in their orthodoxy. So while sects begin because of their uniqueness, they aren't solidified and stuck in it. There aren't written principles and by-laws and rules about who gets to do what in a sect. We have all of that now because we are a denomination. I would also argue that though we say we do not have an orthodoxy, that is not, in fact, the lived experience of many who know us. Universalism remained a sect for longer than Unitarianism, remember? And it thrived on circuit riding and spirit-led worship and church start-ups. It was vibrant and alive and sect-y until it was no longer sustainable because of its sect-yness. They didn't have money and infrastructure to keep it going. Unitarianism became an institution fast because of the power brokers who were Unitarians. Our AUA was Universalism's mechanism for survival because the AUA was already a viable denomination, and not a sect. Now the question of whether or not we are a denomination raises the question of whether or not we are a part of the Church Universal. Because if we are a denomination, we need to be a denomination of *something*. This is why an argument can be made that we are a very stuck and institutionalized sect, I suppose. One that functions like a denomination. I guess I have a lot to say on this subject. We are either part of the Church Universal or we are silly. Sect is what sectarians do. 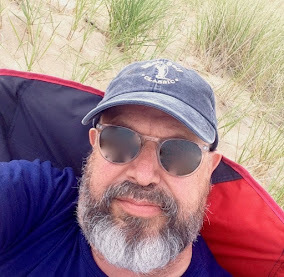 I served three Universalist churches and they were much less involved in themselves than the Unitarian churches I served. The Universalists were very outgoing, open to the wider community. Their heresy is Biblical and embraced by the mainstream Protestants and Liberation Catholics today. And there is the local councils of churches and other united actions, many of us find that important to involve our congregations, the Peace Institute in Boston for example. Tom, I got annoyed with you when I read anti-sect that was a Right position, till I figured out you meant the Right hand side of the chart. Anyway sectarianism is from hell.